This is a winter dish. It's a very filling soup especially so because of the pasta. But it is a great way to use up those winter vegetables. Why not make a nice large batch? You can always portion it away and freeze it for a rainy day when you don't feel like cooking! The quantities are a guideline and should make enough soup for 4-6 people feel free to add more of the ingredient you like the most and less of those that you like less. If you cannot find cavalo nero you could use something like swiss chard, savoy cabbage or kale. You need to make a good quality homemade stock or you could reserve the water in which you cook the cavalo nero and use it as stock. You also need to finely chop the celery, leak, onions and carrots. If you are not using tinned berlotti beans you will need to soak and boil if dried or simply boil if fresh. Meanwhile cook the cavalo nero in salted boiling water until al dente then remove, drain and coarsely chop. Also cook the pasta in salted boiling water just for a few minutes keeping it al dente. Continue to cook until all the pasta is soft and cooked. Serve in bowls with a sprinkle of parmasan cheese and a drizzle of good quality olive oil. This is a vegetarian version of the recipe, you could add meat if you wanted. Why not also try the recipe for Ribolita, just click here. 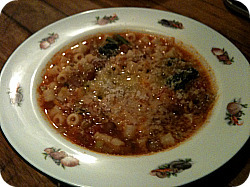 Minestrone is a typically Southern Italian dish and can be traced back to Roman times.